First floor apartment with covered terrace and sea views, located in Carrer Pins just infront the Tennis Club Coves Noves. It has 3 double bedrooms, one bathroom and a shower-room. Independent kitchen fully equipped and utility room. Large dinning-living room. Large communal gardens. 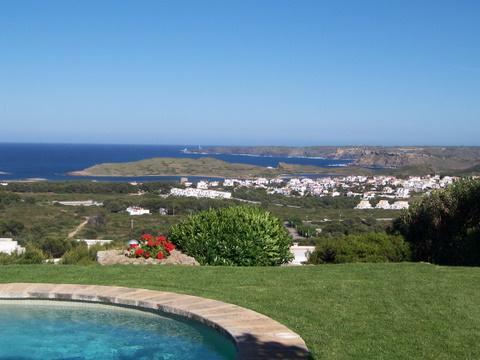 Coves Noves is a quiet complex in the municipal area of Es Mercadal, in the north of Menorca. It's located in a hillside, most of its properties has marvelluos views to the sea and to the coast. At 800m you can find Arenal de'n Castell, a famous beach with white sand, and all the facilities of a friendly beach. Near our complex there are: at 2km Port d'Addaia, an sport harbour, essential per sea and navegation lovers, and at 7km the Campo de Golf Son Parc. Our complex has the Tennis Club Coves Noves, a private sportive club in exclusive use for its memberships, guests and accredited people. There is a very large swimming-pool with communal gardens, tennis and paddel courts, and an snack bar with large terraces.